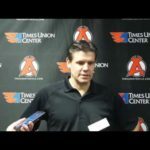 ALLENTOWN, PA – The Albany Devils lost their second game of the weekend as they were shut out by the Lehigh Valley Phantoms, 2-0, Saturday at PPL Center. 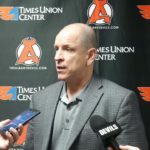 The meeting broke Albany’s 6-0-0 win streak against the Phantoms since they moved from Glens Falls to Allentown, including the 3-0-0 streak the Devils held at PPL Center. 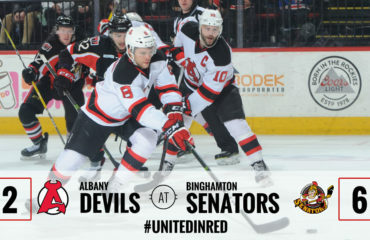 Albany moves to 20-15-0-1. 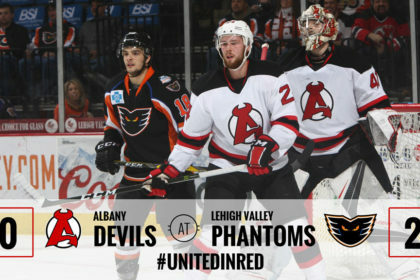 The Phantoms improve to 22-9-2-0. 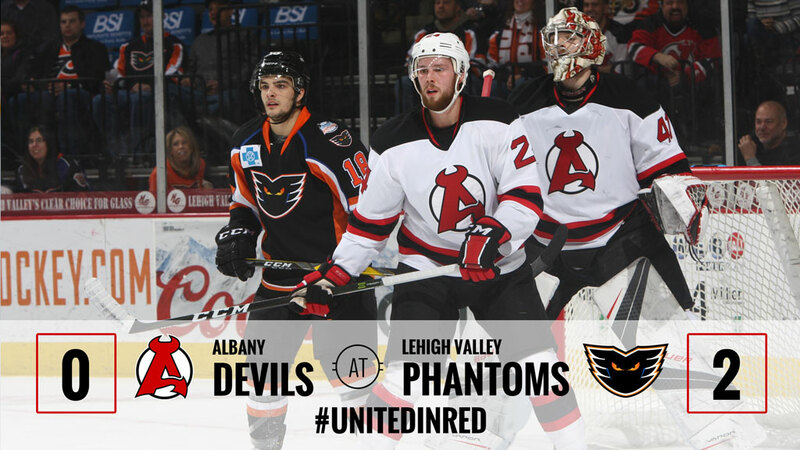 After a scoreless first period, Lehigh Valley’s Greg Carey netted a power play goal at 9:55 of the second. 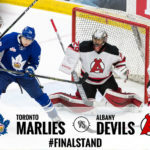 After Vojtech Mozik blocked Carey’s first attempt, he got the rebound past Devils’ goalie Ken Appleby. 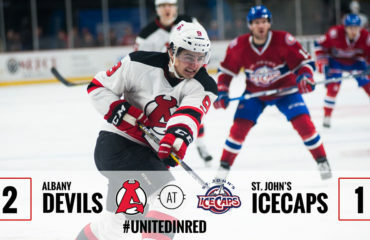 The assists went to Jordan Weal and Chris Conner. 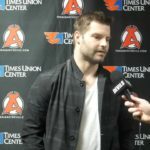 Scott Laughton scored at 18:27 of the second giving the Phantoms a two goal lead. Laughton’s was a shorthanded goal as he fought off Reece Scarlett in the Devils’ zone and found the back of the net. 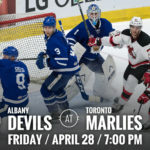 Appleby turned aside 31 of 33 shots and moved to 8-5-0-0. Phantoms’ netminder Alex Lyon earned his second shutout of the 2016-17 season, stopping all 31 shots he faced. He improved to 15-6-2-1. 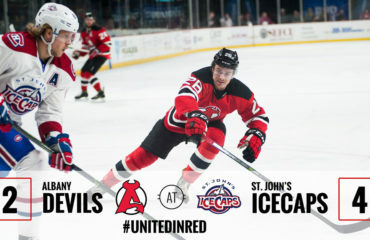 The Devils travel to face the Springfield Thunderbirds Wednesday for a 7:05 pm puck drop at MassMutual Center.